15421 West Mauna Loa Lane has a Walk Score of 36 out of 100. This location is a Car-Dependent neighborhood so most errands require a car. This location is in the Countryside neighborhood in Surprise. The closest park is DreamCatcher Park. Explore how far you can travel by car, bus, bike and foot from 15421 West Mauna Loa Lane. 15421 West Mauna Loa Lane is in the Countryside neighborhood. 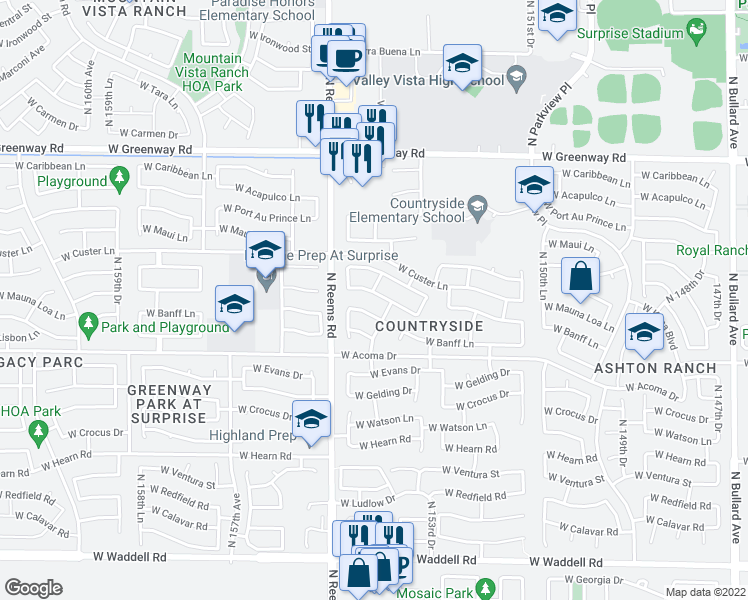 Countryside is the 6th most walkable neighborhood in Surprise with a neighborhood Walk Score of 32. Charming 2 Bedroom Peoria Home Available Now! 16283 N 159TH DR - 3BR 2.5BA Bell Rd/Mountain Vista Blvd --- GREAT UPGRADED FAMILY HOME! CLOSE TO FREEWAYS, SHOPPING AND MORE! DON'T LET THIS ONE GET AWAY! 12935 W. Voltaire--Spectacular Move In Ready 3 Bed + Loft 2.5 Bath Home! - Dysart & Thunderbird! - CALL TODAY!